Sometimes called “the art of taking away”, scratchboard is a medium that allows for amazing detail, but is also surprisingly forgiving and versatile. 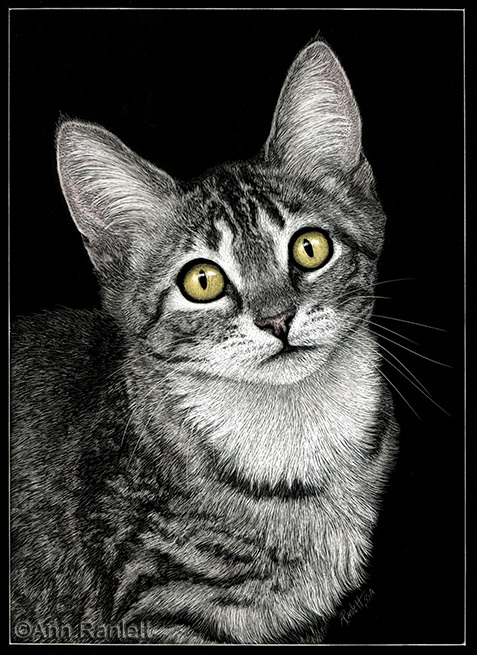 In this workshop, you’ll learn the basic techniques for working on scratchboard. Knives will be used in class, but any abrasive object can be used to remove the black ink from a board to reveal the white coating beneath. Ink can be added and re-scratched, allowing for softness and a range of tones to enhance the detail. Or mail a check for $80 (returning student) or $90 (new student), made out to Ann Ranlett, to PO Box 960, Newcastle CA 95658. Checks must be received prior to workshop. Please contact Ann in advance to let her know you’re paying by check. Full refund for cancellation made no later than 10 days prior to workshop. Cancellation within 10 days of the workshop will receive full credit for a future workshop or a 50% refund. 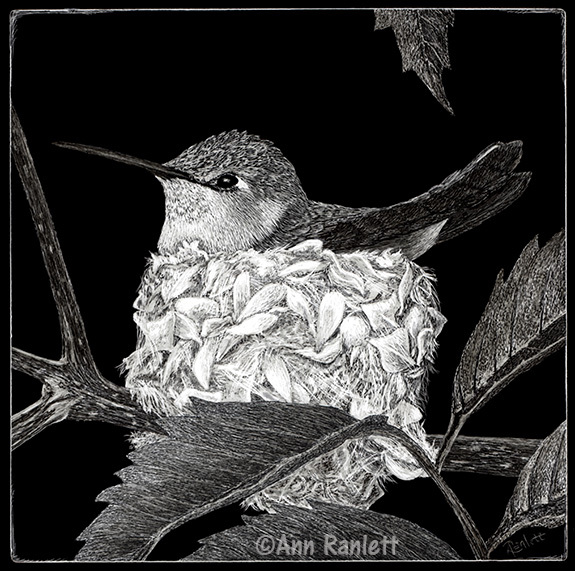 Ann is a Master member (MSA) of the International Society of Scratchboard Artists (ISSA). Her work has been accepted into all of the annual ISSA juried exhibitions to date and she was one of the featured presenters at the 2012 – 2014 and 2018 workshops. In the Open Division: “Sleeping Patterns” received an “Award of Excellence” at the 2013 Exhibition, “Cathy’s Burrito Bouquet” received an “Award of Excellence” at the 2014 Exhibition, and “K9 Ronin” received an “Award of Excellence” at the 2015 Exhibition. In the Master Division “Safety” received a “Silver Award” at the 2017 Exhibition, and “Let’s Go!” received the Best in Show (Gold Award) at the 2018 Exhibition. Videos of the 2012 – 2014 & 2016 presentations are available through ISSA at a very reasonable cost.